We got your letter! No need for forgiveness or apologies, we understand how difficult it can be to only see part of a trend. Wish we could answer each question, but we are limited to 2 pages. When we think we have touched on a question we put its number in brackets like this: [Q14]. All that started to change in 2065. The crowdsourced fourth Complete National Count included all the empty homes that wealthy people owned but didn’t live in. Backing that up with data on the traumatic effects of homelessness we were able to pass the One Home per Owner law in 2101 over the objections of many wealthy people. But, when wealthy people sold surplus homes to avoid the added taxes housing markets stabilized. People were not taxed out of their homes, and we had fewer people thrown to the curb by evictions and foreclosures. Another great spiral of social evolution began with a simple idea: partnerships—mutual, voluntary, co-equal partnerships. For inspiration we looked back to 1992 and Imagine Chicago. [Q6] Because of the power of partnerships, national and international ideas about sovereign governments morphed to consider each person, each family, etc. as sovereign. Gradually, rather than laws which relied on compelling behavior, pledges, which relied on voluntary good and mutual faith, began to get significant traction. [Q4] Beginning in 2125 up until today, the Shared Fate Pledge has cut unemployment down to under 4 percent. For companies, this means in lean times everyone working for the company, executives included, accepts an hour and pay cut, with those in better paid positions taking more of a cut as a percentage of pay than those in less well paid positions. The key is everyone keeps their jobs. This isn’t new, of course, Lincoln Electric (since 1958 has had a no layoff policy), Southwest Airlines, and the Seattle Public Library were using something similar (though without public pledges) back in your day. GOD ALMIGHTY in His most holy and wise providence, hath so disposed of the condition of mankind, as in all times some must be rich, some poor, some high and eminent in power and dignity; others mean and in submission. Winthrop said their colony could become the “city upon a hill” but many people questioned if these attitudes led to American Exceptionalism to always strive to be dominant and the separation of people not only by race but also by status or class. [Q13] Around 2140, a spontaneous national longing arose to get out and meet each other “in the valleys.” A framework was resurrected from an activity used in high schools in the 2000s called Mix-It-Up Day. Sports teams began to encourage tailgate parties to “mix-it-up” and by 2157 brave families up and down and across the economic levels were “mixing-it-up” on Thanksgiving. Much evolved from the combination of mix-it-up events and partnerships, but we’re out of space! Thank you for initiating a National Dialogue Network discussion on Wealth and Poverty in the US “back in the day.” Is that how you said it? Say hello to President Obama from 2188 if you see him! Submitted by Dennis Boyer: We held our poverty and wealth discussion last night (Oct 23, 2013). Eight participants comprised of four couples in rural area. About half had previously participated in test discussion of draft discussion guide entitled “Fairness” (work in progress of the Interactivity Foundation). It lasted about 3 1/2 hours and went very well. Dennis Boyer, IF Fellow and member of the Public Participatory Learning Community. Jo Niehaus, graduate student in Public Administration at the University of Oregon and Special Projects coordinator for the UO’s Erb Memorial Union (ERB), recently welcomed John Spady, volunteer coordinator for the National Dialogue Network, to Eugene, Oregon, for a conversation with club members of the Students for Public Participation (SP2). We met at the cozy McMenamans East 19th Street Café and had a wonderful time talking about the National Dialogue Network, the International Association for Public Participation (IAP2 USA) and its active Cascade Chapter, and also the National Coalition for Dialogue and Deliberation. 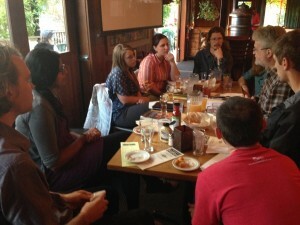 This was the first meet up for UO chapter of SP2 since the start of the term and everyone enjoyed their time together. Thanks to Jo and her UO SP2 students for their time and interest in hearing about the National Dialogue Network. Everyone is welcome to contribute their opinions to the national conversation of “Poverty & Wealth in America” — join in at NationalDialogueNetwork.org/get-involved. Are arts and ‘the classics’ still revered, and what has been added since my time to light the way? Please name several most significant happenings since 2013, such as events, works, people, tragedies, that have contributed to sustaining a world civilization. Has the idea of Capitalism changed? (i.e. Competing ideas of individual wealth & competition versus generosity & fairness) Please consider in 2013 the influence of the corporation… its wealth purchasing favorable & clever legislation, its thirst for profit, its dependence on socially accepted (& advertised) ideas of ambition, competition, wealth, comfort, fear, individuality, w/o responsibility or accountability for plunder of earth or society… versus (unprofitable) primarily social responsibility to humanity and earth. Examples are, consequences of: A government unrepresentative of the people; Continued use of fossil fuels on earth climate; Fracking; Unsustainable use of earth resources for short term gains; Waste disposal and Avoidance of Life Cycle product planning shifting those costs to the public; etc. etc..
What have people come to know about where to place ultimate responsibility for systems of government and social disfunction or disharmony? Are there still individual countries/states or is there one world governing body? Is there a different, perhaps world economy and please describe what you have? In your opinion, what are the connections you see between ambition for wealth, or having influence of wealth (money and property) and the problems we’re facing in 2013… Global Warming, Large Uprisings around the world against those in power, War, Poverty and hunger and homelessness. How would you define Wealth and Poverty in your time? Does it consider Abundance of earth as wealth, and Lack of Realizing that Abundance as poverty? Do you look at Wealth & Poverty, as most do in 2013, being the ultimate, perhaps insatiable measure of success (where Wealth is money, property and power.. and Poverty is lack of it)? And although obviously ineffective at achieving happiness and peace, these seem to have been our values through much of our history. Has society (governance) changed to deal justly and fairly with civil rights and biases that rob women and minorities of their power, their land, their heritage, their freedoms, their just treatment under law? Is there a connection in this to Wealth and/or Poverty? In 2013 we have a big problem: seeing diversity as a problem instead of rich in content and ‘another’ truth. This causes havoc in our ability to achieve harmony in dialogue (and life). Have you overcome this social diasability?